Your vehicle is equipped with a Supplemental Restraint (Air Bag) System and the lap/shoulder belts at both the driver and passenger seating positions. The indications of the system's presence are the letters "SRS AIR BAG" embossed on the air bag pad cover in the steering wheel, on the knee bolster below the steering wheel column and the passenger's side front panel pad above the glove box. The SRS consists of air bags installed under the pad covers in the center of the steering wheel , in the knee bolster below the steering wheel column and the passenger's side front panel above the glove box. The purpose of the SRS is to provide the vehicle's driver and/or the front passenger with additional protection than that offered by the seat belt system alone in case of a frontal impact of sufficient severity. Advanced air bags are combined with pre-tensioner seat belts to help provide enhanced occupant protection in frontal crashes. 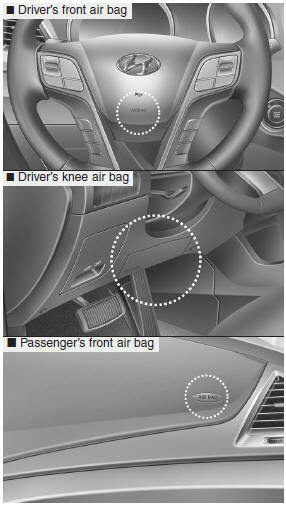 Front air bags are not intended to deploy in collisions in which protection can be provided by the pretensioner seat belt. Always use seat belts and child restraints – every trip, every time, everyone! Air bags inflate with considerable force and in the blink of an eye. Seat belts help keep occupants in proper position to obtain maximum benefit from the air bag. Even with advanced air bags, improperly and unbelted occupants can be severely injured when the air bag inflates. The SRS is designed to deploy the front air bags only when frontal impact is sufficiently severe and when the impact angle is toward from the forward longitudinal axis of the vehicle. Additionally, the air bags will only deploy once. Seat belts must be worn at all times. Even though your vehicle is equipped with the occupant classification system, do not install a child restraint system in the front passenger seat position. A child restraint system must never be placed in the front seat. The infant or child could be severely injured or killed by an air bag deployment in case of an accident.